As part of our Catholic faith, we believe in loving and respecting all God’s creation, and that we have a moral obligation to preserve our world and its resources for future generations. In response, the students at Sacred Heart Area School were challenged to practice and investigate the many aspects of recycling throughout the school year, in hopes to stir lifelong good practices. For the past few years SHAS has been avidly recycling aluminum, raising $2,000 annually, funding various school projects. Recently SHAS has joined the Adopt a Highway Program, adopting 2 miles of US Highway 10 West of Motley. School families will work together to keep this stretch of road clean with our first clean up day scheduled for April 30th. This past month, volunteer, Mrs. Barb Peterson taught a class on healthy food choices for all students in grades Kindergarten – 6th Grade. She explained the variety of foods we need to eat daily to get all the nutrients are bodies require what appropriate servings are, and how to read ingredient labels. 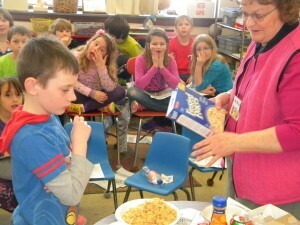 The students were amazed with some of the facts, realizing we most often don’t eat the way we should. We eat foods with way to much sugar and eat multiple servings of what is recommended. We are grateful to Barb for sharing her expertise in health with our students and the impact that she has made.